T-Di MK-2, Bass preamp pedal from Taurus in the Silver Line series. 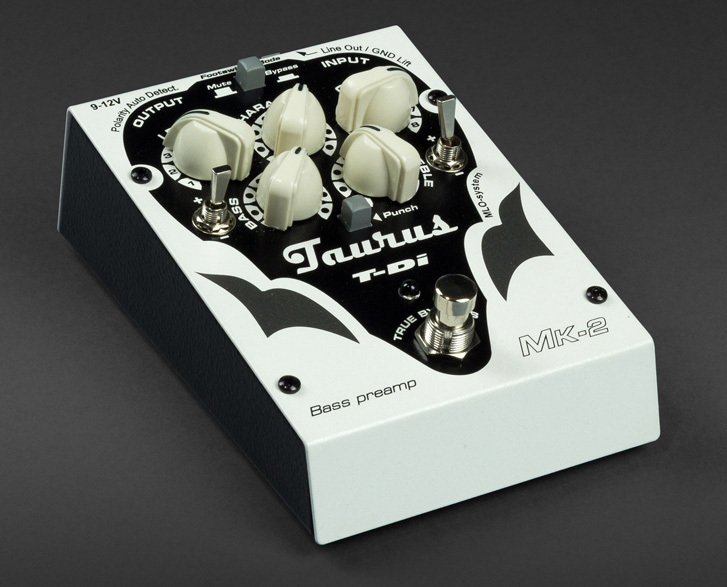 Taurus has released the T-DI MK2, an updated version of its preamp and DI pedal for bass. 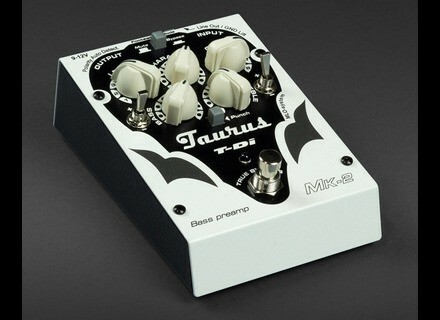 Taurus T-Di Mk2 is a preamp in a foot pedal. It can be used as an alternative solution to an amplifier, but can also be used as a booster for your amp. It can be connected directly to a mixing console on stage or in a recording studio as well as to "Hi-Fi" equipment. It also can work as a typical DI-box or simply being plugged into your arsenal of pedal effects. The MLO (Mid Level Optimization) System is said provides unique and extremely comfortable creation of the sound. It is designed to be intuitional and user-friendly, leaving the user with only two knobs: bass and treble. The proprietary MLO System (included in all Taurus Bass amps) is meant to ensure an optimal mid frequencies proportion, depending of both bass and treble knobs positions. It also ensures the same output volume no matter how far the low frequency control knob is positioned. A "character" knob and "Punch" swith are also included, in addition to standard jack and XLR outputs. More details at Taurus Amplification's website. Try the new Elixir Nanoweb bass strings Elixir Strings improves and extends its Nanoweb string range for electric bass with three new sets for 4 and 5-string instruments. [NAMM] Meet Ogre, new Korean manufacturer Summer NAMM visitors could discover this year the young Ogre Korean manufacturer of effect pedals and instruments. Wampler announces the Low Blow bass overdrive Wampler Pedals will launch on July 1st a new pedal that offers bass players overdrive and distortion effects.